I always appreciate it when development tools and engines are made available to newcomer game designers. They allow beginners and amateurs to make reality a vision of a game they may have, and they also allow for as much customization and creativity as the designer desires. Knight Bewitched is one such vision, allowing a newcomer game designer to share with us his unique and immersive story. Knight Bewitched tells the epic tale of Ruth, a well-respected knight from the kingdom of Halonia. When we first join her, she is tasked to slay a dragon, the spawn of Typhus the World-Breaker. After a successful mission, an image of Typhus appears, vowing to fully return and end humanity as he once attempted in the past. Back then, Typhus set humanity against the race of dragons in a bloody war and a repeat of these events would doom the world. In the meantime though, Ruth is soon tasked to eliminate a lone witch, Gwen. However during the mission, Ruth falls deathly ill and is, in turn, rescued by Gwen. Not able to harm her benefactor, Ruth returns to Halonia and is assumed bewitched and arrested. After escaping her arrest with the help of her squire, Stray, and the assassin, Uno, the three reunite with Gwen to set off into the world to prevent the return of Typhus. The story elements of Knight Bewitched are the game’s greatest strength. Although the overall plot, defeat a big boss and save the world, is a touch on the dry side, the narrative and character development are outstanding. Starting with the narrative, the writing of Knight Bewitched is fantastic, as I found myself immersed and my attention held throughout the game. The banter between the main characters, the plentiful humor, and our heroes’ reactions to enemies and NPCs is all brilliant. 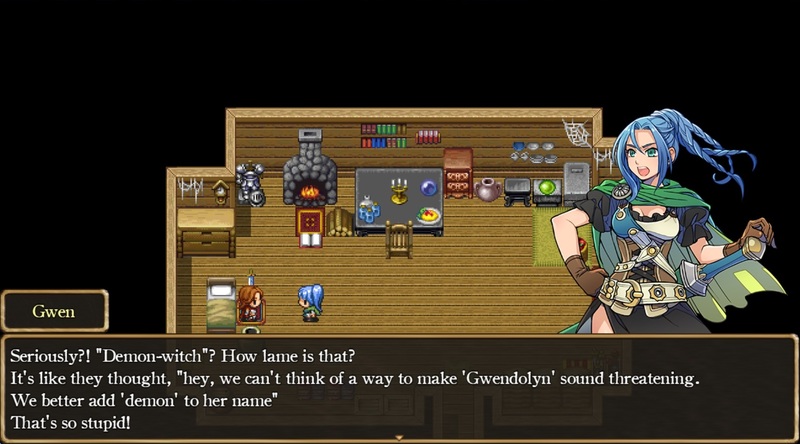 While the game is set in a fantasy setting, there are many references to modern and internet culture, yet these seemingly out of place jokes and references don’t break immersion and only add to the fun and light-hearted nature of the game. The writing overall is incredibly fun and charming. Not once did I find it drag on or become stale. Rather, I was pleasantly entertained throughout. The character development is also impressive, as we see personal struggles and satisfying growth amongst the individual characters. Gwen is a wonderful character. She’s funny, charming, witty, and sarcastic at the perfect moments. Stray is a character easy to sympathize with, given his background, and just as easy to root for. Despite his troubles, he still manages to show his jovial and cheerful sides. Ruth and Uno tend to fit common molds a bit more than the other two, but they are no less likable. Ruth is a straightforward and determined woman, capable of handling anything in her way. And yet despite her upright personality, the ease at being ruffled by Gwen’s banter is incredibly cute. It’s another level to her character that makes her special and enjoyable. Uno, the brooding silent type, does get plenty of meaningful development that lets any player grow to like him on a personal level. He even has his own moments of humor too, which makes him even more memorable. The only complaint I have in terms of story is the relationship between Ruth and Gwen, as I found its development lacking in depth. Early on, we are made aware of Gwen’s attraction to Ruth, as Gwen’s dialogue, inner thoughts, and behaviors all demonstrate her care and growing feelings for Ruth. However, Ruth never properly nor convincingly reciprocates this attraction at all. She is distinctly passive or nonreactive to the point of indifference. Finally, when it’s revealed that Ruth shares Gwen’s feelings, it comes off as such a rushed response, as again, Ruth hadn’t shown any attraction towards Gwen up to that point. In fact, it could very well had been assumed that Ruth had only been concerned for Gwen simply as any other friend or companion. It also could have been assumed that Ruth was straight, bi, or even asexual because of how little the relationship dynamic was actually developed. One-sided until close to endgame and boom, they’re lovey-dovey. This is especially disappointing because all other story aspects like the narrative, individual character development, and humor are all admirably written. It is clear the developer has the talent, but the ball was dropped when it came to the one major relationship in the game. It’s a dishearteningly missed opportunity, as pacing and balanced buildup between both Ruth and Gwen would have made their relationship worlds more intriguing. The story elements are what make this game remarkable, but unfortunately, the same level of quality failed to be maintained in its gameplay. 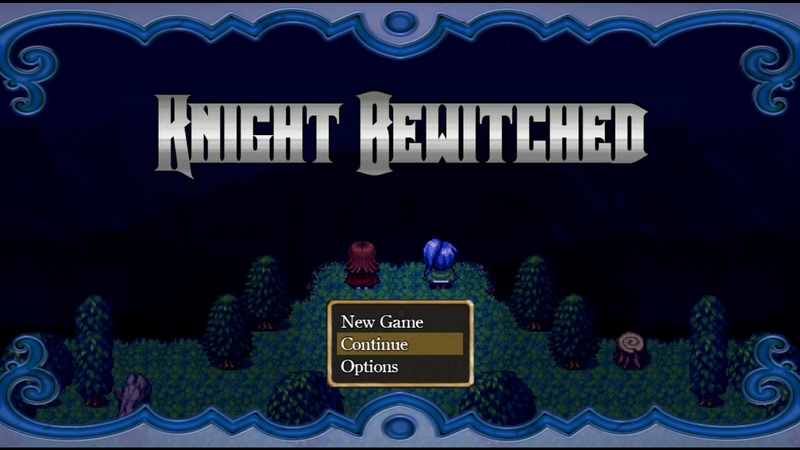 Knight Bewitched does nothing special with its gameplay, relying solely on the cookie-cutter RPG Maker mechanics. It’s not broken. On the contrary, gameplay all works well, yet nothing unique was changed or added to make the experience more memorable. 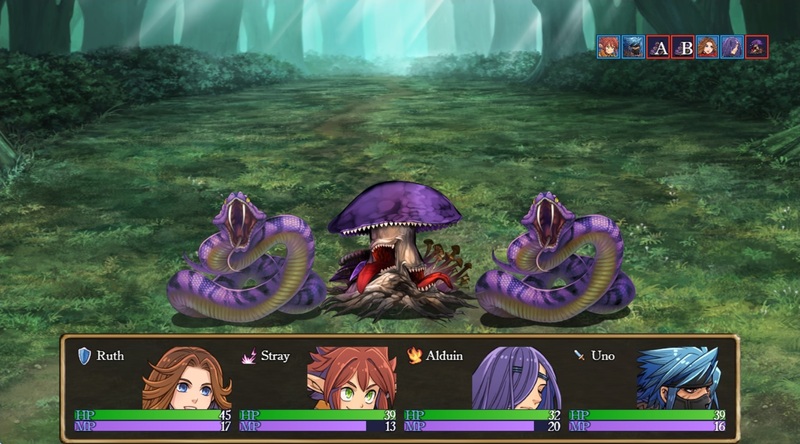 Gameplay is split between combat and overworld mechanics, with battles occurring at random and utilizing the engine-provided turn-based setup. I will say that I found encounter rates and challenge level to be acceptable, never requiring any serious grinding nor ever feeling like your team is over leveled. I did come across one bug, having to do with how status effect turn counts are handled. Turn counters only turn over or refresh when someone takes damage. My team was once sleep-locked by an enemy that could no longer attack, due to it running out of MP. So, no one could attack and adjust the sleep stat counter, resulting in my having to reset the game. I do like that turn order and action icons are visible in battle. 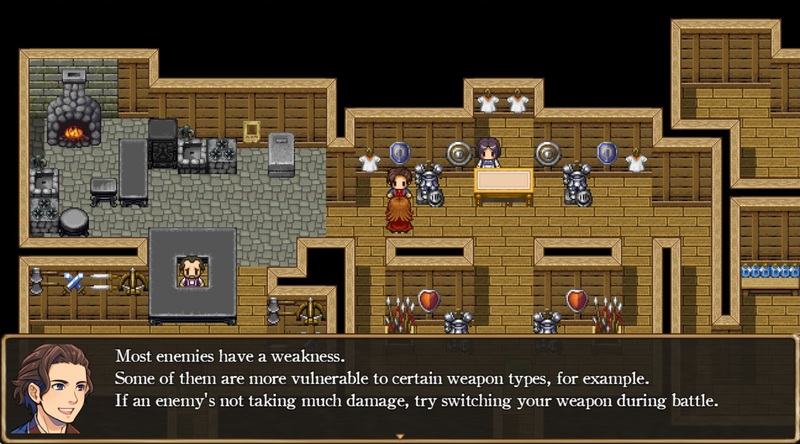 Outside of combat, the world is made of various towns filled with NPCs to interact with and plenty of dungeons to explore. However, exploration is limited to acquiring uninspired items, many of which are unnecessary or fail to give a reasonable advantage upon acquisition. I will say that I do like the variety of obtainable equipment, as they require some strategy to use. They are not your typical “boost everything” kind of equips, so deciding how you wish to utilize your characters and what stats to heighten all comes into play. The ability to change equipment during a fight is also a nice touch. Finally, I found it disappointing that there is only the main campaign to play through, as there are no subquests to be had. Further issues include the complete lack of a quest log. Many times during play, players will be completely on their own to discover where to go next. Only sometimes do teammates or NPCs guide players to the next area. Even when you do receive hints, most often they are vague compass directions. A quest log, especially after spending significant time in a village or dungeon, would have helped remind players on what to do or where to go next. Speaking of being on your own, the first segments of the game provide zero guides or tutorials as to how to actually play the game. 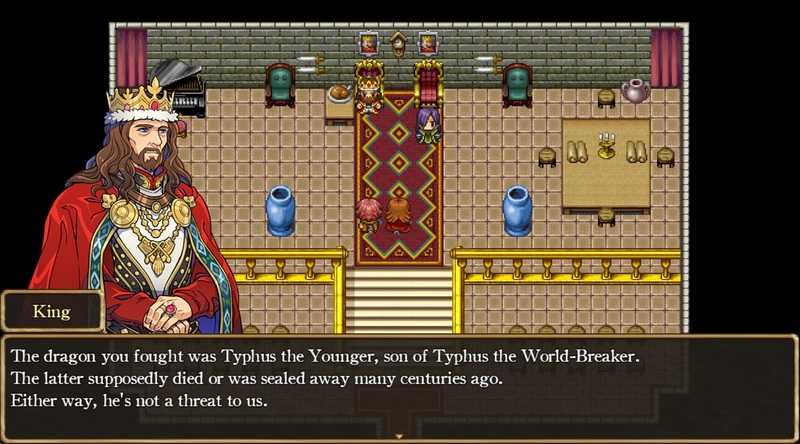 Those familiar with RPG Maker games will undoubtedly figure things out quickly and will regard this as a non-issue. Yet, not everyone has played RPG Maker games and may not be familiar with its standard use of the Z, X, and C buttons, or its alternate configurations. (I prefer using Enter, Shift, and Num 0.) Only after your first boss fight does a gameplay guide become available. Overall, gameplay is uninspired, its lack of quest logs hurts, and the potential struggles for newcomers as to how to play may take away from their experience. As I stated, I really do like the idea of mechanisms and tools that allow anyone to create a game on their own. 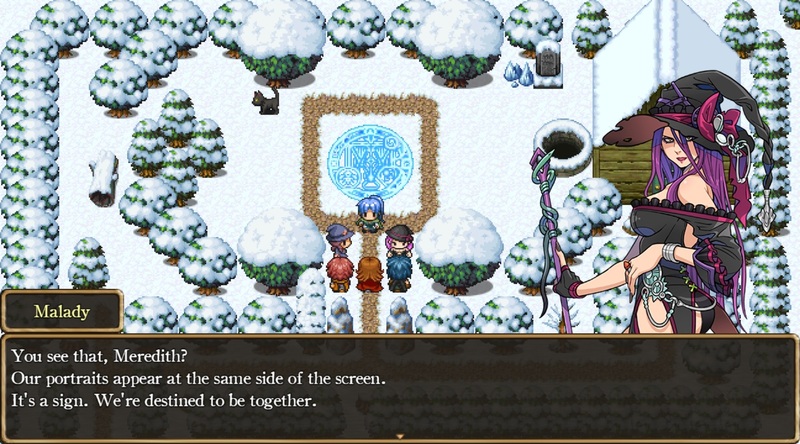 RPG Maker, Unity, Ren’py, you name it. Having said that, I do take issue when developers completely rely on the tools and assets available with zero effort to leave their own marks. This is exactly the case here in regards to the aesthetics of Knight Bewitched. There are no custom pieces of art, nor are there any original pieces of music. Most of the assets are taken from RPG Maker Fes and some from other RPG Maker and free asset sets. Now I fully understand that not everyone is an artist and even fewer are musical composers, so much so that I forgive the use of pre-made music, but there are options available to leave a unique visual mark, whether it’s through commissions or teaming up with volunteers willing to help. It’s disheartening to see a complete dependence on pre-made visual assets, as I believe any custom artwork would have brought more life and impact to these characters. Instead, the reliance on stock artwork, which is someone else’s vision, is unfortunate. I will say this. I suppose it is impressive that the developer managed to use Fes assets for a PC game, as Fes is only available for the 3DS. I haven’t figured out how this was done, since I don’t believe Fes assets are available to download for any of the PC-based RPG Maker engines. Regardless, I would have preferred custom artwork, especially if the game is being sold for profit. 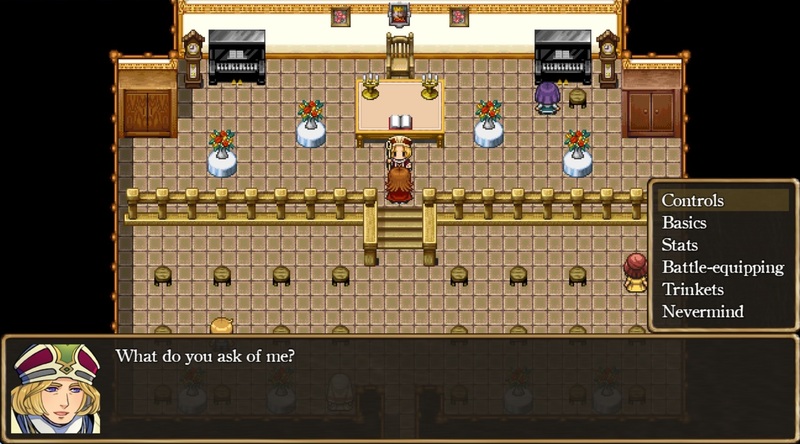 Instead we get stock portraits, stock sprites and tilesets, and zero in-game CGs. 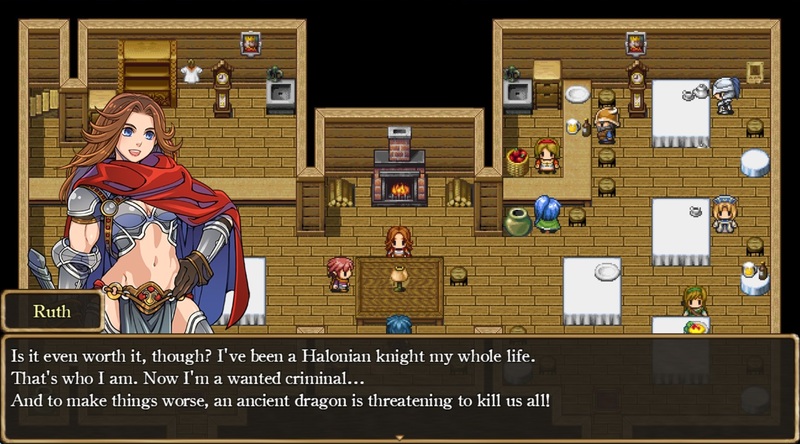 Knight Bewitched is a marvelous story trapped in a less than stellar game. The game overall is painfully average with a few hiccups too, which is disappointing given the impressive writing waiting to be discovered. With unremarkable gameplay and a full dependency on engine assets, it is difficult to rate this any higher than our average score of 2.5. Again, nothing here can be considered awful, but its many bright spots are just as soon cancelled out by its flaws and the end result is a game few would consider a gem. I would perhaps argue that this story would have been more outstanding in another media form, rather than an RPG. My thoughts aside, Knight Bewitched has its charm and points of brilliance, and for about $5 for this roughly 10-hour campaign, I can still easily recommend this to those looking for an RPG with terrific immersion, strong narrative and a very easy group of characters to root for. I hope we see a continuation of the Knight Bewitched saga in the future.